One of the things I like about Hong Kong is the wide abundance of so called wet markets. They are vibrant centres in the community. Offering a wide variety of goods, from fresh vegetables, tofu to meat and fish chopped on the spot. The operations are very low tech and look like nothing has changed for the last decades. Other than the occasional finger print checkin and energy saving lights rather than the traditional light bulbs. Fruit and vegetable sellers have their wares spread out and nicely lined up to entice customers to buy it. Walking past a stall triggers a response where the staff highly recommend their products by touting they are the best, juiciest, cheapest or whatever is applicable. In this case fruit is selected either by yourself or the fruit seller and put on a scale or the price is just shouted out if it is by the piece. A critical piece of equipment is...the bucket. The bucket is where the money goes. It hangs at an easy to reach place, and on the other side of the string is a counter weight. 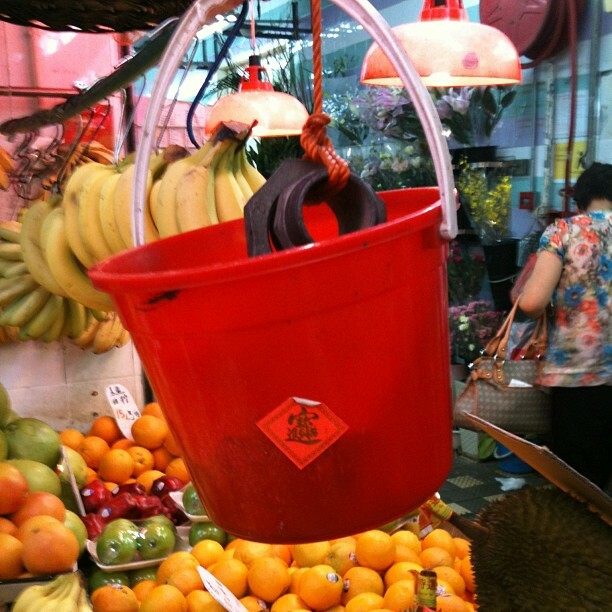 When you pay for your goods, the bucket gets pulled down. The merchant drops the cash and grabs the change. When handing over the change, the bucket is let go and flies back to its position. Low tech, but highly effective!